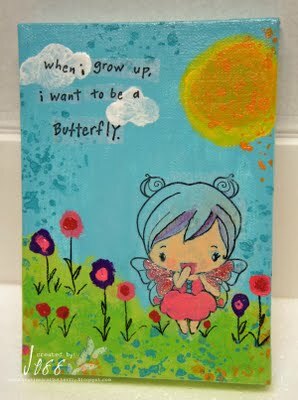 I’m in love with this mixed media stamped and painted canvas from Jess at the Whimsical Butterfly blog! She combined paints, stamps from The Greeting Farm and markers to make this wonderful canvas. Find more info here on her blog. Hey there! Thanks so much for featuring my canvas on your blog! I had a ton of fun making it and totally know what you mean about mixed media- I’m gonna get myself in trouble w all the things I ‘need’ for this newfound technique, LOL! Thanks again! Fun to see it featured here!